Control rats with rat traps and other green methods. In depth and humorous article! In the future the world will be taken over by rats and rabbits. I can imagine a rat parliament with rabbits in opposition and a third party of cockroaches always on the outside waiting to make their mark but never quite getting it right. When you think about it not much different to now. That�s one of the reasons we should control pest like these. In this article I will deal with rats but in the future if we are spared the furry menace I will move on to rabbits and more! I have controlled rats and other pests for 18 plus years, mainly using strong and highly toxic chemicals. I recently decided that if it was feasible and the results would justify it I would use a more eco-friendly or green method of control, I call eco friendly any thing that does not use chemicals, I know some of you old die-hards will say there is only one way and that is to poison but let me assure you that other methods are available. Half rat, half squirrel, has a new pest been discovered in the jungle of Laos? Click above to find out. As I said, green or eco-friendly control could be using a good ratting terrier. I have Jenny, trapping using either live catch or kill traps, air rifles and pistols and the relatively new product that does not contain any chemicals and works in the opposite way to conventional rodent control, this one thickens the blood as opposed to thinning it. I have been getting fantastic results with rat control using the chemical free rodent bait. This is a bait formulated from ground maize, wheat and sweet molasses, it takes only 40-60 grams to do the deed. Normally the rat dies in the burrow but should the rat die above ground there is no danger to carrion feeders or your cat because no chemicals have been used, (the product is approved by the barn owl trust) and there are no residual toxins in the rodent body. When using the bait it MUST be the only food source, so that means no scatter feeding of the hens, remove the bird feeder; put the pony nuts in a rodent proof container. When you put the hens away at night make sure the feed hopper is on chains 18 inches off the hen house floor, I know rats will come down the support chains but the harder we make it the better. When I do surveys of a property or smallholding with a rodent problem the first thing I look for is fresh droppings, this is an excellent indicator as to the size of the infestation, I always take notes and recently I have started using my digital camera to record details for my files. Rats like to feed in open ended tubes or tunnels so if you can place bait in a tunnel all the better. I prefer to use rat bait stations that have been made for the purpose, these keep the bait dry and have open ends, but an old tube from the big bales or even a plank against the wall will do. It is important with this type of bait that it is kept dry, if you want to put it in the burrow directly I wrap a hand full in cling film and put it down the hole, ALWAYS WEAR GLOVES when working on rat control, and disinfect any surfaces the rodent comes into contact with, especially in kitchen, dairy, egg store/packing area etc. Along with the above there are quite a few types of rat traps available, I tend to use the Monarch type rat trap. This will trap more than one rat at one setting, the best bait for this is something smelly, fish head, garlic sausage, bacon or similar. There is also a type that is known by a few names but in the north we know it as a family type rat trap. This also catches more than one rat, they can enter from the rear once the front trap door has sprung. I use this type in a small infestation, say in a household kitchen. Once again bait with smelly things. I also use a single catch trap, if you have only seen the odd rat use this trap, as with all traps they are best used, as I said earlier, in a false tunnel use a plank or piece of slate leant against a wall. When controlling on a large scale there is a large multi catch trap which will catch dozens of rodent at one setting. This is fantastic, I use these on poultry farms, as we all know it is very difficult to control rats where there is poultry in either a small scale few hens to battery farm type egg producers. Remember that rats have to be disposed off in a humane way I would never advocate drowning, they can take hours to die, and I tend to use an air pistol. There is also a newish rat control weapon that will perhaps be added to the armoury. I am trying it at the moment and it's called the Rat Zapper. This gives the rat a lethal shock using only AA batteries. I am told it will despatch up to 10 rats with one set of batteries. It looks very promising at the moment! When you start rat control you need to take a few things into account, rats are neophobic which means they are wary of new objects, so have patience with your control. I get calls from people who say they have one rat, this I find quite strange, most rats being social creatures are in multiples. When doing the survey do not under estimate the level of infestation. There are always more rodents than you think. Rats have to drink water every day as opposed to a mouse which can get enough water from its food. Rats can start to bred from 6 weeks of age and with a litter of up to 12, the small infestation soon becomes am major problem. 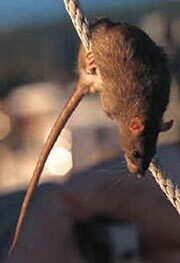 Most rats in the wild have a life span of 6-9 months so work that out, thousands from 1 pair in one year. Whenever you are dealing with rats you must have high regard to personal protection. Rats carry a multitude of diseases some fatal, so rubber gloves must be worn at all times. Don�t use the canvas and leather type they will hold contamination. Always carry out pest control in a safe and responsible manner, be humane. If using traps they must be checked every 24 hours, if you can check them every 12 hours all the better. Have patience these are wild animals that don�t want to be caught or controlled. If it doesn�t work first time try another bait in the trap or put the trap somewhere else. If using chemical free bait, make sure there is no alternative food source. Remember we might be voting for one of these one day unless we control them now.